Bring LuGia’s to you with LuGia’s on Wheels! 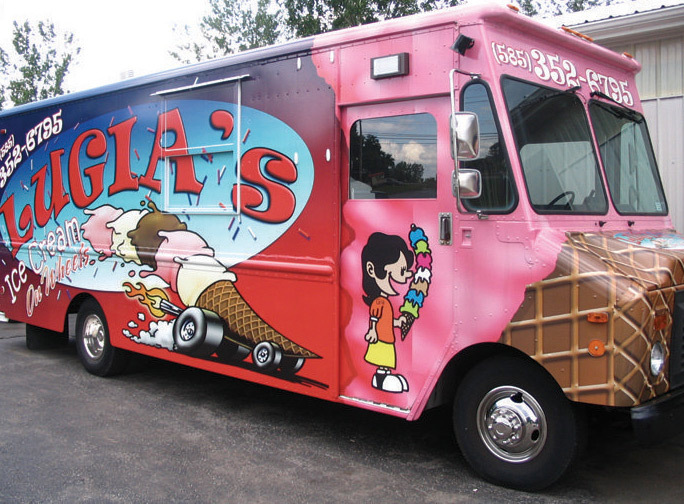 We do everything from corporate events and birthday parties to weddings, block parties, and festivals: anywhere you would like to have ice cream and fun! We supply everything you need, including ice cream, toppings and our very own professional ice cream scoopers! Our truck “Lil Luke Sundae” will show up at your party, festival, or special event full of ice cream and ready to go. We’ll handle everything from serving to clean up so you and your guests can just sit back and enjoy! In the end, we will charge you for how many people actually get ice cream, and then that will determine which price category you fall into. Adults and children are the same price. You will be charged for a minimum of 25 people. For weddings only: We will charge you for the number of confirmed guests when we get your final count a week before your wedding. If we serve more than the confirmed number of guests, you will be charged at the end for the additional people served. These prices are for inside Erie county for our Buffalo branch. Outside Erie county there will be a $50 per half hour travel fee. Some public locations require a permit in order for us to bring our truck. Please inquire if a permit is needed and let us know. Sometimes we are charged a fee for the permit. Any additional cost we may incur will be added to your final bill. Our staff will be keeping track of the number of people that get ice cream. You can choose up to five flavors of hard ice cream, the sixth flavor will be Vanilla. You can choose up to six different toppings, whip cream and cherry are included, so you get 8 toppings total. Your guests can have their ice cream in a dish, they can have a cone on top of their ice cream that is in a dish. They can have as many toppings as they would like, or they can have a sundae. However they would like to eat it, doesn’t matter to us, the pricing is all the same! We bring regular cones, dishes, napkins and spoons. We supply everything (except garbage cans) so you don’t have to do a thing! If you would like to have our Ice cream cart there will be an additional $100.00 set up fee on top of the standard set up fee and price per person. Check for availability before you book an event. We serve our baby; which is our one scoop of ice cream. If people would like to come back for seconds they can, but you will get charged for another person. If you want to limit people to one ice cream then you can provide tickets to give to your guests, that way they have to have a ticket to get an ice cream. Make sure you let us know if you will be using the ticket idea ahead of time. We are not responsible for providing tickets to your guests. We are not responsible for people coming up to get ice cream who are not a part of your event. We would recommend the ticket idea if you are concerned about final count or are holding your event in a public place. Serving time depends on the amount of people at your event. We could serve for 30 minutes, 45 minutes, or an hour. It will be no longer than an hour. We will serve until everyone gets an ice cream. If you need us there for a longer period of time then it will be an additional $75.00 for each additional hour that we are there. When our truck arrives at your event we need the contact person to come out and meet the driver. We require minimal set up. Our truck arrives approximately 15 minutes before your scheduled serve time. We do everything we can to ensure timely arrival of our trucks, however trucks may run late due to weather, traffic, inadequate directions or other unforeseen circumstances beyond our control. If you have specific driving instructions that GPS may not detect please include in the “other details” section on the contract. If for some reason the truck should run late we will call ahead to the contact person to inform you. Cancellation Policy: If you need to cancel your event you must give us at least two-weeks notice (14 days from the date of the event). Anything less than a two-weeks notice and your deposit is nonrefundable. Date Change Policy: If you need to change the date of your event you must give us at least two-weeks’ notice (14 days from the date of the event). Anything less than a two-weeks’ notice and you will be charged a rescheduling fee of $25.00. Time change policy: *Choose your start serve time wisely, our trucks are very busy and the time you put on the contract CANNOT be changed within the two-week time frame. If you need to change your time we need at least 15 days notice, and even then we may not be able to accommodate the change unless that time is available. Rain policy: Our trucks come rain or shine; if you cancel due to rain your deposit will not be refunded. If you decide you would like to book an event please provide us with the business or school name (if applicable), your name and email, the date and time you would like us to start serving, and the town in which the event will be taking place. At that time, we will email you a contract to complete and return with your deposit (if applicable) to hold the date. If you have any questions, please feel free to contact us at buffalo@lugiasonwheels.com or you call us at (716) 352-0007. We look forward to hearing from you!